Before leaving Magadan, Henning and I had gone to the Jazz Port Cafe for dinner. We had just gotten our first course when Victor came over and in broken English introduced himself and explained that he had seen our bikes out at the airport where he now worked. After we finished our meal we joined him and his party at their table. A few vodkas later Victor launched into a wild and vivid story. Understand that his English wasn't that good, and our Russian even worse, so much of the story was told in pantomime. As he charged about the restaurant Victor explained that he had been stationed on the Finnish border when he was in the army. While walking towards his post he was suddenly attacked by a large brown bear. He managed to get a few shots off from his AK 47 before it jammed. That wasn't enough however. The bear kept coming. Victor stood his ground, knowing that if he ran he would be pulled down. 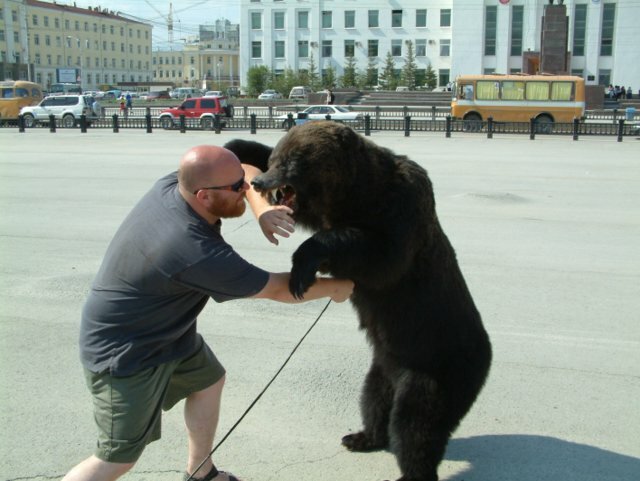 The bear charged him and grabbed him by the arm with his fierce jaws and clawed his stomach open. Victor happily showed us the scars to prove his story. But Victor was not to go down that easy. He was able to pull out his knife and stabbed the bear in the midsection. He kept cutting upwards until the bear died. He managed to crawl his way to his post to get medevaced. For which he was charged $3,000. Ever since then, Victor has had a deep hatred for bears. As he sketched out on a napkin, he became an avid bear hunter. His weapon of choice - a T-72 tank. He claims to have killed 7 more bears with a tank before leaving the service.